What union response to job losses? Some good ideas by Aussie unionist, Tim Gooden, Secretary of Geelong & Region Trades & Labour Council, on how the union movement in Australia needs to respond to the economic crisis. 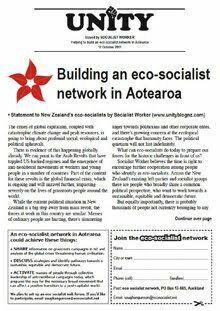 There are concrete proposals here that the union movement in New Zealand should consider. -UNITYblog editor. The global financial crisis isn’t just clipping the wings of grossly overpaid bank executives and speculators in shonky “financial instruments”. It’s going to hit ordinary working people hard. Even if the trillions being injected into the bloodstream of the world financial system manage to restore its heartbeat, growth rates will fall and unemployment will rise. A whole generation of workers, who since 1991 have only known economic growth, will find out what it means to lose a job and not find another. The flight to the Dollar - why and for how long? from meltdown101 26 October 2008 The flight of capital to the dollar has been churning along at breakneck speed over the last week, taking down other currencies with the sole exception of the Japanese Yen. Investors are running home to Mama while waiting to start the Musical chairs again next week and hoping to find one when the music stops. by Gareth Porter from Information Clearing House 22 October 2008 The final draft of the U.S.-Iraq Status of Forces agreement on the U.S. military presence represents an even more crushing defeat for the policy of the George W. Bush administration than previously thought, the final text reveals. by Mike Whitney from Information Clearing House 25 October 2008 Things are getting worse. On Friday morning, futures trading was halted for the first time ever after futures plunged more than 5 percent. The sell-off came after another 500-plus down day on the Dow followed by steep declines in equities markets across Europe and Asia. Japan's benchmark index, the Nikkei, slipped more than 9.5 percent after Toyota and Samsung reported disappointing earnings. The news was equally bad in Europe where shares were battered across the continent on fears of a global recession. Since September, $16 trillion has been erased from global stock market value. Losses in the US--where the financial turmoil originated--have been much smaller than other, more vulnerable markets. The Dow is down less than 40 percent from its peak of 14,000, whereas Hong Kong, Poland and China have all tumbled more than 60 percent. Its a bloodbath. by Peter de Waal Rod Oram in his article, Doomsayers have got it wrong, in the Sunday Star Times (26 Oct 2008) writes: "Still, the banks deserve criticism. They scooped up easy, low-cost credit overseas over the past decade and aggressively lent it to households here, fuelling the debt-driven consumer and housing boom. In doing so, the banks made a mockery of monetary policy. They showed how ineffectual the Reserve Bank's official cash rate is in guiding the economy." "The second argument for impending financial disaster is equally misjudged. Yes, it's true the four Australian-owned banks that constitute 90% of our banking system are heavily dependent on overseas funding. Because we are such poor savers, they raised 40% of their funding as of February this year from overseas sources for a total of $116.5 billion. That was almost a four-fold increase from $33.5b, or 29.6% of their funding, in December 1998. And, incautiously, they borrow short - on average terms of less than a year - but lend long for the likes of mortgages. That wasn't a problem when the world was awash with credit as it was over the past decade. But it has been a problem since global credit markets began collapsing in August last year." When Oram says, "because we are such poor savers", he means NZ's slave-level wages caused by 25 years of attacks on unions and other wage-growth restraint policies has left 80% of the population with no savings safety net. It also means that the rich are worried that there is not a pool of wealth that can be readily tapped to dig the system out of the mire, unlike after the 1987 crash when most households owned their own dwelling and had savings. The fact that the banks "raised 40% of their funding as of February this year from overseas sources for a total of $116.5 billion" is the real worry. As the fake economy of derivatives and the non-existent assets that underpin them (like sub-prime loans) is around six times the size of the “real” trading economy, and the focus of the international bailouts is a pathetic attempt to pay down this fake economic debt at the expense of the real economy, you can only expect it is going to get much harder to borrow money. On Oram's figures I would remove 40% of available capital and do the numbers again and see what kind of interest rates/house prices/economic picture you come up with. Below is a brilliant must-read exposure by Ondine Green of the irrational world of financial speculation and how the bursting of the biggest bubble in history will impact on us in New Zealand. The financial markets are on the verge of complete systematic failure. The kings of finance want us to fall on their swords. As Ondine Green argues, we need to urgently put forward concrete demands which connect with the fears of ordinary people and opens up pathways to a more rationally controlled economy. Henry Ford's genius was to get workers to buy into the system as consumers, by using mass production to make consumer goods affordable. Wages at Ford's factories were set to make sure that a worker could buy one of the cars they made within a reasonable amount of time. 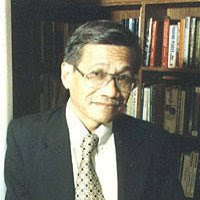 However, by introducing the contradiction that the health of capitalism was dependent on workers' purchasing power, the system was made less stable in the long run. The Great Depression was a cycle of attempts to restore profits by cutting wages, thus depressing demand, thus reducing profits. Only massive public works – including rearmament for WW2, especially in USA and Germany – broke the cycle. Whose Money Are We Guaranteeing? by C.D. Sludge from Scoop 20 October 2008 Banks Are The New Temples A 2-year-old boy of my acquaintance used to remark when he noticed a bank in the street - "there is one of my temples" - and looking at recent political responses to the financial crisis, public and political understanding of what is going on is not a great deal more mature. Having failed the taxpayer and public catastrophically the banking community has now been presented with a solution which solves nothing. Grant Brookes, co-leader of RAM's candidates group, was recently interviewed by Thomas Berger, a freelance journalist with Germany's two left-wing daily newspapers, "Junge Welt" (Young World) and "Neues Deutschland" (New Germany). Thomas Berger: What are the chances for a broad left party in New Zealand at the moment as well as in the future? Grant Brookes: The chances for a broad left party in New Zealand today are huge. 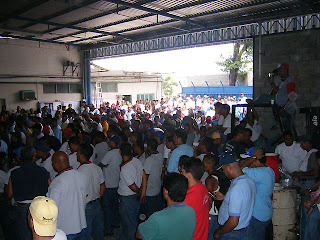 Workers at Sanitarios Maracay in Venezuela meet to discuss the running of the factory. Workers make decisions collectively and elect workers to leadership positions. by John Minto from The Press 21 October 2008 You're unlikely to have heard of Sanitarios Maracay but by the end of this column I hope you'll take the time to find out a bit more. The international economic crisis has been in the headlines for two months now. For the most part, New Zealand has watched developments from the sidelines of a crisis centred in the arcane world of shareholdings and risk, confidence and speculation, guessing and gambling. RAM - Residents Action Movement Media release 22 October 2008 Tomorrow Reserve Bank governor Alan Bollard is widely predicted to slash the official cash rate by an unprecedented 1% in order to moderate the effects of the global economic crisis. The 1.3 million Kiwi homeowners paying off a mortgage will be keen to see whether the Reserve Bank's cut is matched by a reduction of the same magnitude in their trading bank's interest rate. A fortnight ago, when the Reserve Bank of Australia cut the official interest rate by 1%, the big Australian banks reduced their interest rates by only 0.8%. "In a co-ordinated move, the Aussie banks boosted their already massive profits at the expense of Aussie home buyers," said Grant Morgan, chair of RAM - Residents Action Movement. 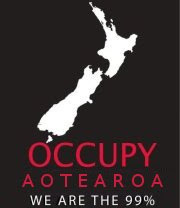 "Their New Zealand subsidiaries will adopt the same greedy tactic here as well if they think they can get away with it. We need to shame them and stop them," said Mr Morgan. INTEREST RATE SURVEY Several days ago RAM initiated a financial survey which has so far attracted around 250 responses in Auckland, Wellington and Whangarei. One of the three survey questions asks: "Do Australian-owned banks in New Zealand charge mortgage interest rates that are too high?" "90% of respondents replied yes to this question. The survey's interim results indicate that an overwhelming majority of Kiwis think the Big Four banks are interest gouging," said Oliver Woods, co-leader of RAM candidates group and a candidate for Auckland Central. "RAM is standing in the election to give voice to the voiceless who are being shafted by corporate interests like the big banks," said Mr Woods. PROTECT OUR PEOPLE CAMPAIGN RAM is launching a "Protect Our People, Not the Speculators" campaign. Different elements of the campaign include reducing the cost of home loans, removing GST from food, making speculators pay with a Financial Transaction Tax and lifting the minimum wage to $15 an hour. "RAM's Protect Our People campaign won't end on polling day," said Grant Brookes, co-leader of RAM candidates group and a candidate for Wellington Central. "We are a people's movement. So after the election, RAM will continue to mobilise the grassroots around things like winning 3% state loans for first-home buyers of modest means, and forging a broad coalition around a referendum petition to remove GST from food," said Mr Brookes. BACKGROUNDER ON THE BANKS Here are the Big Four banks in New Zealand and their Australian owners: ANZ National Bank - owned by Australia & New Zealand Banking Group (Australia). This amalgamation of the ANZ Bank and the National Bank constitutes the biggest banking operation in New Zealand, holding over one-third of home mortgages ($55 billion). Bank of New Zealand - owned by National Australia Bank. BNZ is the second largest bank in New Zealand as measured on total lending assets. Westpac- owned by Westpac Banking Group (Australia). ASB Bank - owned by Commonwealth Bank of Australia. The Big Four banks control 90% of the banking industry in New Zealand, putting them in a near-monopoly position. The Big Four banks have been hugely profitable. In the 2007 fiscal year, the ANZ-National Bank made an after-tax profit of $1.1 billion. "We expect to make more than a billion dollars profit again in 2008," said ANZ-National chief executive Graham Hodges. (NZPA 28.7.08.) The BNZ has announced an after-tax profit of $785 million in the 12 months to 30 September 2008. And ASB Bank cornered a $515 million net profit for the 2008 fiscal year. The Australian owners of the Big Four banks enjoyed a combined after-tax profit of A$15 billion in the last financial year, partly composed of wealth generated by their subsidiaries in New Zealand. 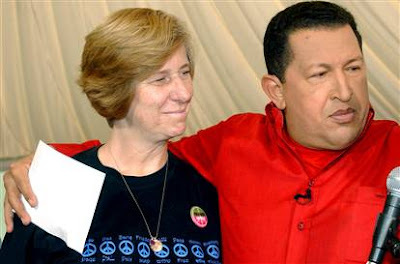 Anti War activist and challenger for House Speaker Nancy Pelosi's Congressional Seat (CD 8, California), Cindy Sheehan has indicated her intention to launch a National political party after the U.S. Election of Nov. 4.
by Margareta Pagano and Simon Evans from The Independent 12 October 2008 The market is worth more than $516 trillion, (£303 trillion), roughly 10 times the value of the entire world's output: it's been called the "ticking time-bomb". It's a market in which the lead protagonists ­ typically aggressive, highly educated, and now wealthy young men ­ have flourished in the derivatives boom. But it's a market that is set to come to a crashing halt ­ the Great Unwind has begun. Graphic from US Socialist Worker, 10 October 2008. The massive hand-out to the rich by the US government has sparked a wave of grassroots anger. Click on image to enlarge. MANY PEOPLE are understandably frustrated when they try to make sense of the world financial crisis based on what they read in mainstream newspapers. These papers typically fence off business news into a special section dominated by jargon. Until the economic crisis broke, television news anchors rarely mentioned the economy except to give stock market reports or figures on economic growth. 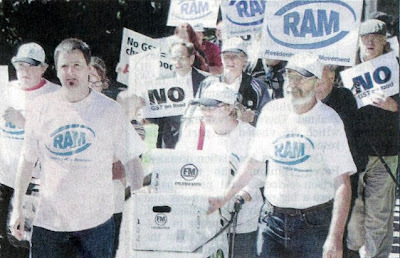 UNITYblog editorial 7 October 2008 The NZ Herald seems a little paranoid that RAM (not mentioned by name) may pull together a coalition to run a Citizens Initiated Referendum petition on GST off food. The NZ Herald editor feels it’s timely to rally against the whole idea of Citizens Initiated Referendums: "The right to be heard does not automatically include the right to be taken seriously", the 5 Oct editorial bemoans. It's important, the editorial goes on, "to highlight the futility of the entire process of the referendum." They are "pointless" because "they reduce extraordinarily complicated hot-button issues to emotive pieties." The target of this elitist rant comes into view. "Removing GST on food - the subject of the latest petition for a CIR - would be a mind-bendingly complex and impose massive compliance costs on businesses (which would add to food prices). 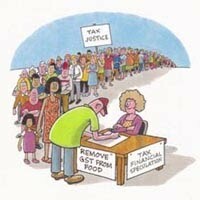 But people are signing up to the idea in droves because it sounds good." Unlike every previous referendum, a referendum petition on GST off food strikes at a central pillar of neo-liberalism: its unjust taxation system. This is serious. The editorial concludes: "the right to be heard does not include the right to have someone else foot the bill for your self expression." From the opposite site of the class fence this spokesperson for corporate privilege proves exactly why a campaign to remove GST off food is such a good transitional demand. Grassroots democracy ("self expression") in the form of a CIR petition on GST off food would unite the majority in a popular campaign to indeed get "someone else to foot the bill". That "someone else" being the corporate classes who've benefited from the historical transfer of wealth from the poor to the rich under the guise of neo-liberalism and globalisation. All who defend GST on food (from newspaper editors to political parties) will reveal where there class bias lies. A rigorous defence of this neo-liberal tax (as looks likely) will further sharpen an awareness of class divisions that's growing everyday in the minds of masses of people. A struggle over GST off food will increase consciousness of the structural divisions within society, just as corporate welfare for billionaires is currently doing so on a global scale. This opens up enormous political possibilities for a profound reforming of societies' foundations. A broad left party, like RAM, that is part of this process, understands it and encourages it, can hope to provide the strategic leadership which goes way beyond just GST off food. A broad left party in today’s historical conditions can grow to be a trusted spokesperson for the grassroots majority. Providing the necessary leadership in this unavoidable global war between the haves and the have nots. The Wall Street meltdown is not only due to greed and to the lack of government regulation of a hyperactive sector. It stems from the crisis of overproduction that has plagued global capitalism since the mid-seventies. The handover of the GST-off-food petition to Maori Party MP Hone Harawira on the steps of parliament received more good media coverage, particularly in Wellington. Over the two weeks of the People's Procession and in the build-up beforehand there were probably a hundred or more radio, print and television reports. This extensive media coverage means the GST-off-food campaign has ingrained itself in mass consciousness. All goes well for a possible CIR petition next year. 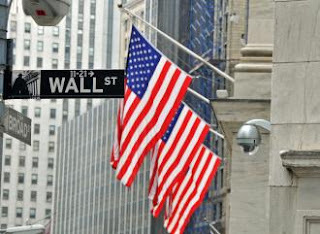 from US Socialist Worker 30 September 2008 THE COLOSSAL theft of $700 billion in taxpayer money to save Wall Street's super-rich was on hold as of Monday night, after a vote on a financial bailout was defeated in the House, triggering the biggest stock market plunge in 20 years. Anyone with a sense of justice has to welcome a setback for legislation that would take money out of the pockets of millions of working people--now and for generations to come--and use it to replenish the coffers of banks run by profiteers, speculators and outright crooks.